Well, I’m back from Seattle / Washington state and have to say that I absolutely L.O.V.E. it there. With My Better Half telling me for the last ten years or so, that I would…I have finally seen it for myself and agree that I do. I admit I had a preconceived notion about the area. Having heard about their frequent rainfall and high suicide rate I was turned off without actually seeing it for myself. I was wrong. I was wrong and could actually see myself living there in the future. In my last post I wrote about how I went to Pike Place Market on my own and was too self conscious to take pictures until I was too laden with bags to do so. Well the next morning my husband and I went back and did a little shopping. With all the trips he’s made to the area in the past, he had never taken the time to visit the market himself. 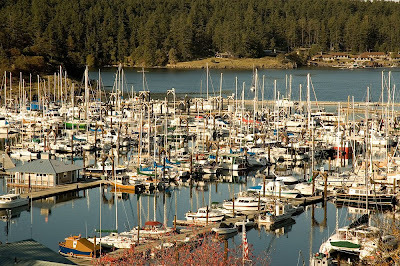 After that, we drove an hour and a half to Anacortes to catch the ferry to San Juan Island. 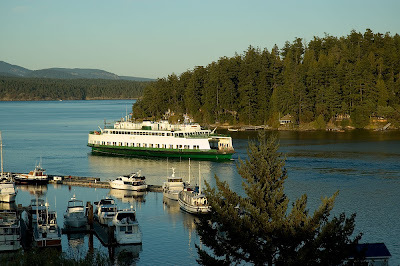 The hour long ferry ride then transported us to picturesque Friday Harbor. With views like that, a fireplace and whirlpool tub in the room, how could I be happier? Well let me tell you. I am not all that sophisticated, but I am known to be suave. So when I saw these in the bathroom I was in heaven. I love Aveda products, but won’t spend the money on myself. 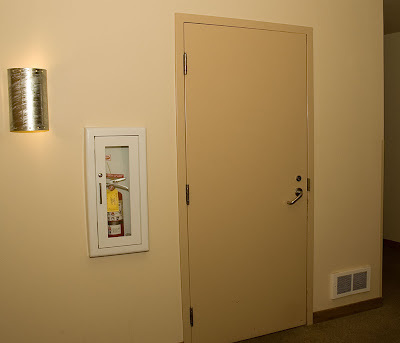 Anyhoo, upon leaving our room to go down for dinner I noticed this door outside our room. It was the door to the supply closet. Thee Supply closet. There lay the cache of mini-sized Aveda treasures…for the taking. My Better Half played devil’s advocate with me so I reluctantly closed the door and proceeded to the dining room. 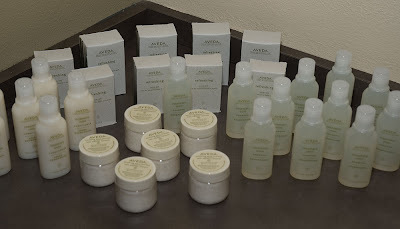 …I realized my Aveda stash was now cashed. Under cover of a champagne induced haze with the Mission Impossible theme playing in my head I decided it was in my best interest to raid the hotel supply closet. …And then, because I was eyeing the 100% Egyptian cotton spa robes, My Better Half decided to lock the door to said storage closet. The next day we drove around the island and took some pictures. My husband is the photographer, and an excellent one at that. When he gets back maybe he’ll let me share some of his photos, but in the meantime here’s one that I took that day. P.S. I know I haven’t been around here lately, but I will be and hope to get caught up on everyone. P.S.S. Somehow, as I was unpacking, I came across a new robe…hmm? I wonder how that got in my suitcase; and why do I have the Mission Impossible theme stuck in my head? If you opened the above link, you’ll note that I chose the original ‘Mission Impossible’. My dogs aren’t allowed to jump on the couch, so Tom is definitely out. Those pics are so pretty. I would never guess Seattle would be a place I would like either but from your pics, I have changed my mind! Egads, you are brazen. Now that theme song is in MY head. Great photos - and send me some Aveda! I've actually never used anything from them before. Ha ha ha! I love it! Glad you guys had a good time! And enjoy your stash! Hey, if they left the supply closet unlocked, it's their own fault that some extra swag got lifted. I totally would have done the same thing. Oh my...those pictures are beautiful! I would have done the same thing as you with Aveda...I love that stuff, but it's sooooo expensive! As I was reading I was like there is NO way she really isn't going to get in that closet!!! I was almost to the point of screaming at the computer like men to do the TV during football! I think you should have taken the robe too.. I am NOT a good influence! I would totally smile if you sent me one of those little items!! ;) haha I am so wrapped up in your mischievous self that I didn't even tell you how beautiful the pictures are! You just make me laugh out loud! 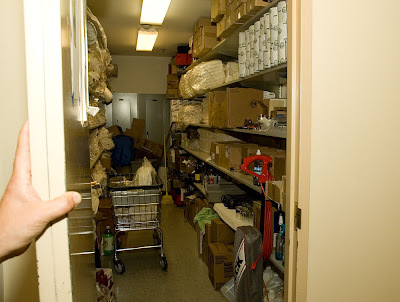 I could just see you stalking the supply closet! 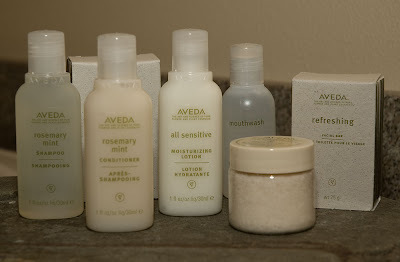 :-) I LOVE the Aveda Rosemary Mint shampoo & conditioner, but won't spend the $$$ on it. Glad yall had a great trip! AHHHH! How could I miss the part where you said you got a new robe!?!? Freakin great!!! wow! 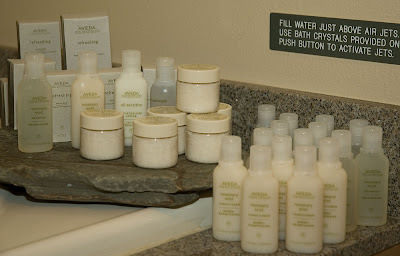 I cannot get over the fact that your hotel was filled with Aveda treasures. Most excellent! So, you're a thief. Love it! I love Aveda, and I would have had the same reaction as you if I was faced with a cache right outside my door. If my best friend was with me, we would have cleaned that whole closet out. Sounds like you had fun. Great pics! I lived there for a solid year, September to September, and when it's beautiful, it is really beautiful. When it rains, though, it goes on and on and on. I have depression and seasonal affective disorder, so I was ready to slit my wrists during the wintertime there (when the sun was barely up by 9:30 and was sinking by 3:00...I never saw daylight). This isn't to discourage you, if you are a different kind of person, but it didn't work out for me. 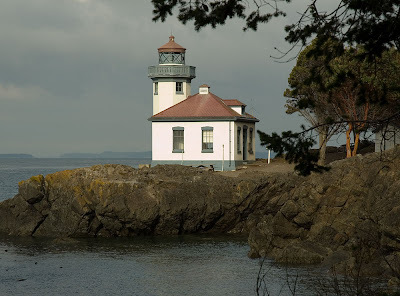 I did enjoy going to Whidbey Island and visiting the vineyards and enjoying downtown Seattle and going to Mt. Rainier, though. But I couldn't ever go back. This is also why I turned down a job in Vancouver, B.C., a few years ago. Same climate. So glad you had a great time. Your pictures are wonderful and if his are even a little bit better they will be just awesome. New robe huh? I'll leave that one alone! Very nice view from your room! I would swear that the ferry you got a picture of is the one that I ride from Seattle to Victoria when I'm there. Aw, maybe they all just look alike tho. Aveda products, you say? I would have emptied that storeroom STAT! 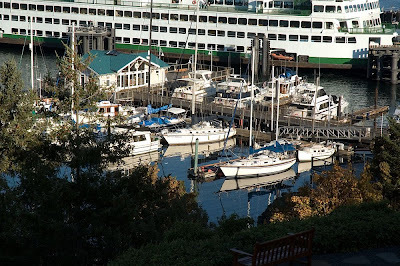 Seattle is a lovely place - one of my favourite cities in the world. So glad you had fun and glad to have you back! Oh, you make me want to go back! Such a beautiful place - so very green and lush! And lady - you crack me up with your Aveda stash.